It is perhaps the fact that I spent some enjoyable times working in Oslo that I have a bit of a soft spot for Norway. The generally easy going nature, the sophisticated culture and the sense of wellbeing amongst the residents of Oslo helped me feel right at home. Not to mention the finest smoked salmon and roll mop herring I have ever tasted. Back in the late ‘90s I knew much more about Norway’s financial industry and smorgasbords than about its relationship with Jews. Jews and Norway do not have a good track record. In World War II many of its Jewish citizens were left unprotected from the 5 year Nazi occupation. 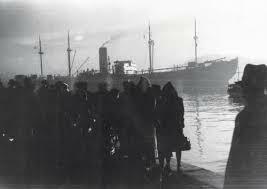 Those who could escape fled the country to the safer borders of neighbouring Sweden or the UK, but the ease with which the SS Donau deported a third of Norway’s Jews to the concentration camps of central Europe remains a stain on Norway’s history books. There were of course exceptions, brave people who stood up and protected their fellow countrymen, but they were far fewer than in many other parts of Europe. That many Norwegians gave up their Jewish neighbours was perhaps symptomatic of a history of ambivalence and intolerance towards ‘others’. Although post-war Norway has attempted to atone, an assertive shift to Liberalism and the Left and its apathy towards extremism has yet again allowed other forms of hatred to escalate unchecked. This week there has been the usual internet storm regarding another ‘human rights’ offence by Israel. This time the issue has been in not allowing a Norwegian doctor, Mads Gilbert, back into Gaza where he has previously been working. This has vastly overshadowed two other Norwegian related news stories which have appeared predominantly in the Jewish / Israeli press. The first is the news that a Holocaust Memorial event was only permitted providing funds raised from the event went to a Norwegian ‘Gaza Appeal’. The second was a memorial event which to commemorate the 70th anniversary of Kristallenacht. Several of the participating groups proposed the banning of Jewish representatives at the event. With these in mind, I returned to my interest in Norway and research that I had previously uncovered about its relationship with its Jewish population. • By the country’s constitutional law, from 1814, Jews were not allowed within the Kingdom of Norway. Whilst this law was revoked, this was only ever done informally and not by statute. • One third of all Jews were given up to the Nazi occupiers in WWII. • To this day, anti Semitic hate crimes are not recorded by Norwegian authorities as the category does not exist in Norwegian law. This has allowed Norwegian authorities to suggest that anti Semitism is not a significant problem (which of course it isn’t if you don’t record it). • An Oslo municipality survey in 2011 found that 60% of students had heard the use of the word “Jew” used as a negative expression or insult, and now it is common parlance. • Oslo and Trondheim’s synagogues are amongst the most heavily fortified (non-military) buildings in the country as attacks (perceived, threatened and actual) are common place. Despite the enlightened view of Holocaust awareness, the Norwegian Broadcasting Corporation reported that anti Semitic attitudes were prevalent in a number of schools. Teachers revealed that “Jew hate has been legitimatised” and prevention or disruption of teaching about the Holocaust is common place. Authorities have also recently recommended that wearing the Star of David should be resisted as it could be seen to be inflammatory. And whilst people across Europe were rightly disgusted by a French comedian who regularly courts attention by espousing extremist and anti Semitic views, a popular Norwegian comedian (Otto Jespersen) was not censured for making “jokes” on national TV about the murder of Jews in concentration camps that I do not wish to repeat in print as the comments were far too disturbing. The Mads Gilbert case is still somewhat unclear. Israel is refusing to explain their decision to ban him from Gaza. As his home town Tromsø is twinned with Gaza the Israeli government may not win any popularity contest in Norway. But ignoring Mads Gilbert’s record for saving lives in Gaza’s al-Shifa Hospital is unwise and misguided, even if the his opinions on subjects such as boycotting Médecins Sans Frontières and America’s culpability in the terror attacks of 9/11 are unacceptable and sourced from deeply entrenched anti West narrative. Mads Gilbert is, as one of his countrymen put it, a “hopeless politician” but one, nonetheless with the goodwill of the majority possibly on his side. Wouldn’t it be better all round if he was offered the opportunity to work in one of Israel’s hospitals where trauma victims of the conflict are brought in and where other doctors could all learn from Mads Gilbert’s experience and skills? Would that not be positive outcome for all concerned? The two decisions relating to the Holocaust memorial activities in Norway have been widely published in Jewish media circles but not outside. In fact it would appear that there is no story to report with respect to these two items in Norway. It is possible to “conflate” (a popular word in defence of anti semites) the issue of anti semitism and Gaza as well. Giving money from something which remembers anti semitism to some of those who would possibly engage in its latest incarnation seems conflation of the most cunning and pernicious type. Meantime, Norway’s authorities and media stoutly defend themselves as wrongly accused of anti semitic values, whilst the Simon Wiesenthal Center has put Norway on its watch list and there are indications that the US State Department has privately expressed dissatisfaction to its Norwegian counterparts. Norway’s Foreign Ministry may have overlooked the irony, as they have complained to Israel over this accusation rather than addressing this within their own communities. So, is it any wonder that the three news items concerning Israel, Jews and Norway are all related? Is it any wonder that Mads Gilbert should feel such loathing towards Israel? Is it any wonder that the news of Jewish conflation with Israel is taken in a purely negative and anti Semitic sense? It is difficult for Israel that Norway, a country with such a good reputation, regarded as beacon of civility, is so comfortable in its demonisation of Israel. It will certainly do Israel’s reputation more harm than good as long as these anti Israel views emanate from country’s like Norway. Publicising Norway’s relationship with Jews will make little difference as the world will happily turn a blind eye to the attitude. Nonetheless, we must do at least that. It is no coincidence that the most renowned of the Middle Eastern “peace negotiations” is the Oslo Accord. It may have failed to achieve any lasting benefit to Israel and Jews (or the rest of the region), but its notoriety promotes and elevates Norway’s reputation with peace and links the Norwegians to something that belies their attitude to Israel and Jews and oversteps their influence in world politics. As Norwegian Jews leave its shores once more, Norway may now be in the process of succeeding where the Nazis failed, in becoming the first European nation to be Judenfrei or Judenrein (the Nazi term for the ethnic cleansing of Jews). Never has the concept of the Oslo Accord, the organ for a peace between Israel and the Palestinian state, appeared to have been more paradoxical. This entry was posted in Uncategorized and tagged Anti Semitism, Israel, Jewish, Norway, Palestine on November 16, 2014 by admin.